In the run up to Valentine's Day 2016, Brook, the sexual health charity, will be holding a free condom shop in Dalston called, open to people 24 and under. The event will be promoting the local condom distribution scheme come correct which is commissioned by LBH to reduce teenage pregnancy and STI rates. Note that it's only for people under 24! 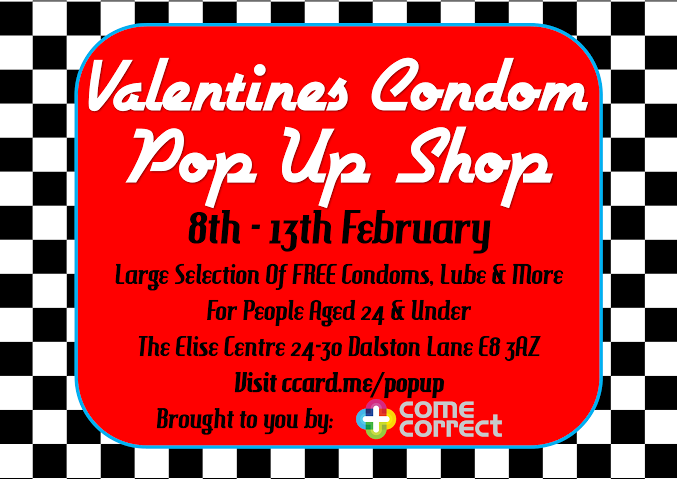 "Come Correct are hosting a free condom pop up shop in Dalston leading up to valentines day. The shop is for people aged 24 and under. There will be a very large selection of condoms, lubricant and more all for free! The shop is in The ELISE centre which is a 2minute walk from Dalston Junction station. Once you are signed up you can then also get free condoms in many locations in Hackney and across London where you can go before and after the pop up shop!"